This article appears by permission of the author. Most enviros despise Wal-Mart, the world's largest retailer. In the past, it never donated to charities and wouldn't lend a hand to any cause. Enviros thought of it as stingy -- an uncaring, mammoth corporation. Today, there must be lots of enviros in a quandary as Wal-Mart tries to change that image by handing out big, fat donation checks to the nonprofit groups. Wal-Mart's business practices go against all traditional environmental values. It has no qualms about tearing up open space, increasing urban sprawl and leaving big, drafty buildings empty as it moves across town to even bigger ones. It's well known for part-time, low-waged employees, using cheap, overseas labor, and continually forcing suppliers to cut costs. Its business practices run out the local mom-and-pop stores, which goes directly against the concept of "shopping locally." One of Wal-Mart's new image-buster donation programs is 'Acres for America.' Under this banner, it donates money to shut down one acre of land (also called conservation) for every acre it develops or plans to develop in the next ten years. Wal-Mart "partners" with a nonprofit group set up by Congress in 1984, the National Fish and Wildlife Foundation (NFWF). The leaders of NFWF are Mark Rockefeller, worldwide developers, realtors, investors, traders, and Thurgood Marshall, Jr., a partner in the law firm Swidler Berlin Shereff Friedman. The NFWF is the dealmaker that gets all the partners together -- land sellers and buyers, donors, grantmakers, and Federal agencies. They leverage one donation to entice other funders for projects, and they assist in the partners' collaborative (defined by Webster's as treasonous) meetings. It's a well-thought-out scheme and a government policy called "new environmentalism" with a "market-based" approach. It allows the world's richest people to bypass laws, shut down citizen rights, and scoop up America's resources. Before her government appointment by President Bush, Department of Interior (DOI) Deputy Secretary Lynn Scarlett was vice president of research for the nonprofit group, the Reason Foundation. She was "one of the nation's leading voices for a 'new environmentalism' ... 'civic environmentalism,' the explosion of state and local experiments in new forms of environmental policy that emphasize decentralized decision making, flexibility, market incentives, private stewardship and bargaining rather than rulemaking." Scarlett's policy advisor is Karl Hess, Jr. who wrote the book 'Visions Upon the Land: Man and Nature on the Western Range' that "proposes 'a market of landscape visions' that would allow Americans to protect different parts of the Western range in their own ways." An April 2005 deal announced by Wal-Mart and NFWF is a great example of new environmentalism in action. They partnered with the Conservation Fund, a nonprofit group that's led by Nelson Rockefeller, Jr., Riley Bechtel of worldwide developer Bechtel Group, global investors, oil and energy plants, and attorneys. Their partnership was part of a plan to raise $4.5 million for the Grand Canyon Trust (GCT), another worldly connected group from Flagstaff, Arizona, see Thayer's article in Range Magazine's 2003 Winter edition, "Why You Can't Trust the Trust"), to buy up two private ranches in northern Arizona and southern Utah, and the related grazing permits and water rights. Wal-Mart invested $1 million in the buyout scheme, along with two private foundations. The Richard King Mellon Foundation came up with $2.5 million, and the Gordon and Betty Moore Foundation gave $1 million. Wal-Mart also pledged another $35 million to the GCT over the next decade for management and restoration. Coincidentally, Wal-Mart heir, Sam Walton, Jr., recently established a residence in Flagstaff and is giving thousands of dollars to other Flagstaff enviro groups. The GCT ranches, Kane and Two Mile, cover 1,000 private acres and have grazing and water rights on nearly 900,000 more acres of Federally-claimed lands (also known as public lands). 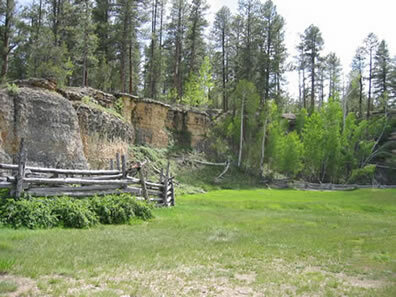 Kane Ranch covers most of the northern district of the Kaibab National Forest, and Two Mile Ranch encompasses nearly all of the Vermillion Cliffs National Monument. Together, they make up the North Rim of the Grand Canyon National Park, a United Nations' World Heritage Site. At the bottom of the Grand Canyon is the mighty Colorado River. The ranchlands are a big chunk of the Grand Canyon Wildlands, a United Nations' core reserve consisting of millions of acres designated for animals only -- no humans allowed. David Gelbaum, Wall Street mogul, was the seller of the ranch properties, grazing permits and water rights. He bought it all in 1997 and 1998. During that time, Gelbaum also bought other private grazing and water rights in the Badger Creek area, which borders Two Mile Ranch. The secretive Gelbaum has been called the cash cow for the enviro group Sierra Club with his $101.5 million donation. Here's another coincidence: Gelbaum's professional investment holding companies have the name "Sierra" -- Sierra Trading Group, Sierra General, and Sierra Enterprises. These companies have been major shareholders in the United Kingdom firm, the Bankers Investment Trust. In 1995, Gelbaum co-founded a nonprofit called the Wildlands Conservancy with the group's current executive director, David Myers. 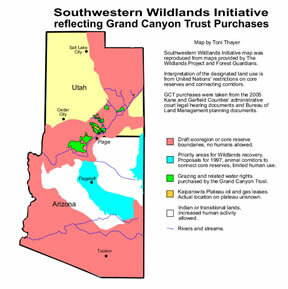 The two have been securing some of the best property throughout the Southwest during the past decade -- "hundreds of miles of wildlife corridors across mountains and deserts, tying together once-isolated national parks and wilderness areas," according to an October 30, 2004, article by the Foundation Center. Myers kept Gelbaum's identity a secret, "despite growing curiosity about who was bankrolling this obscure conservation organization that was buying and swapping real estate with the gusto of a 19th century land baron," said a Los Angeles Times story on the professional investor, also printed in October 2004. The Los Angeles Times article went on to say that "Gelbaum has made his largest contributions to the 10-year-old Wildlands Conservancy." The GCT ranch buyouts are touted as a "first-of-its-kind." According to Bill Hedden, Executive Director for the GCT, in an August 2, 2004, High Country News article, "We need new ways to do things, and this private partnership represents one of the new ways." Hedden explained further, "We didn't want to see it go to a bunch of smaller operations, all trying to make a living grazing cattle. 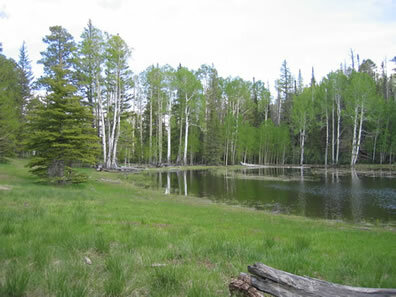 . . Our goal is to protect and rest the land and find money to do restoration work... This will be one of the largest grazing reductions to ever happen in the West." 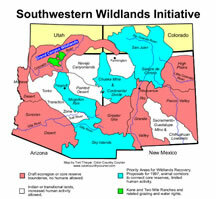 In the same article, Hedden identified the ranches and "surrounding public lands" as potential habitat for Mexican wolves. Randy N. Parker, Utah Farm Bureau's Chief Executive Officer, said, "The Kane Ranch, with grazing permits for 1,200 mother cows, generates nearly $750,000 in direct farm gate sales... [and] generates around $2 million in economic activity and produces over 70 jobs annually." Hedden's grazing reduction concerns Utah ranchers and Kane and Garfield Counties. Besides worrying about more devastating impacts to the downward racing economy, they've challenged the legality of the GCT's already done deals and buyouts in Utah, and whether the charitable group is qualified to own them. Current laws require that permits remain in the hands of "real ranchers" who will run livestock herds on the lands. Another big issue is whether BLM and GCT have illegally bypassed the required notice to Congress when a land use is eliminated from 100,000 or more acres of Federally-named lands. At the Administrative Law Court Hearing in Kanab, Utah, in May, the judge allowed testimony by cattlemen's representative Richard Nicholas, who kept a detailed diary of private conversations and meetings with DOI and Bureau of Land Management (BLM) higher-ups. With Nicholas' testimony and actual letter copies from Utah's U.S. Rep. Chris Cannon to DOI Chief Gale Norton, to BLM Utah State Director Sally Wisely, and on down to DOI Lynn Scarlett and the GCT, a conspiracy to eliminate livestock grazing was shown. The hearing has been continued until September 2005. At press time, the Salt Lake Tribune issued a report on new DOI grazing regulations that "will require ranchers to either use the grazing lands they lease from the government, or give up their permits so others can use them." The Utah ranchers and counties are a little leery of new DOI regulations and are unsure if the policy will work for, or against, them and their local economies. The Los Angeles Times story concluded with a tale from 2000 about Gelbaum winning "the admiration of then-Interior Secretary Bruce Babbitt." Babbitt and former President Bill Clinton wanted to designate the area as the Vermillion Cliffs National Monument, but "Babbitt's plan provoked the ire of local ranchers, who complained that it would run ranchers off good grazing land." According to the Los Angeles Times, "At the height of the protests, Gelbaum's ranch manager stood up in a packed meeting hall and explained that his boss controlled all the grazing rights in the area and considered the monument perfectly compatible with his ranching operations." "The speech hushed the protesters and allowed the monument to go forward." "I half-thought about recommending to the president to name the national monument after David Gelbaum," Babbitt said. "Without David Gelbaum, it might well not have happened." Of course, Gelbaum's ranch manager didn't tell the local ranchers that his boss would be selling the whole kit and caboodle in just a few short years to an enviro group that repeatedly stated it wanted to eliminate grazing in the West -- but this is exactly how the conspiracy works. Want to know more about anything you're read above? Visit http://www.Google.com and put your search terms in parentheses, up to a total of nine words. Example: "Wildlands Project" "Richard King Mellon Foundation." If you don't get enough results, drop it to "Wildlands Project" "Mellon." Too many results? Try an advanced search, with the results in English, using SafeSearch and keeping the exact phrase "Wildlands Project" and ALL the words: Mellon Foundation. Want more information on property rights? Visit http://www.PropertyRightsResearch.org, http://www.vlrc.org and spend some serious time at each. There is much truth to be mined from both sites.